Good afternoon! After two weekends away, I am finally back with another Sweet & Simple design for you. You just need two polishes, ideally a creme shade and a shimmer or metallic shade. I chose Wet 'N Wild Black Creme and a polish I want to spotlight today--Darling Diva Bohemian Rhapsody. Once the base has dried, use your shimmery or metallic polish to paint about 2/3 of the painted tip, leaving 1/3 as an accent stripe of sorts. To clean up this line, remover would obviously mess things up, so instead you can use a bit of your previous colour to fix any mistakes. Grab a toothpick and dip it into your creme shade to get in close if you want to be more precise. Now let's talk a bit about my second shade. 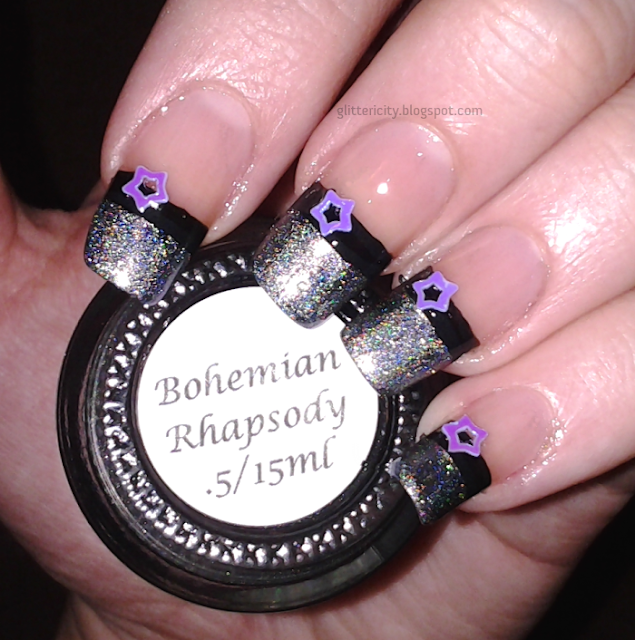 Bohemian Rhapsody is an absolutely stunning polish that has it all. Multichromatic, shimmery, and linear holographic? Be still my heart! Darling Diva has lots of great shades, but I think she's really outdone herself with this one. It primarily looks silvery-sage-green in the bottle, but shifts to a stronger silver and sometimes a lilac. I never would have thought to do a holo-duochrome polish! It's just beautiful. Here it is looking more silver..
Bohemian Rhapsody is still available, along with a few other polishes like it but in different shades. You should check them out! 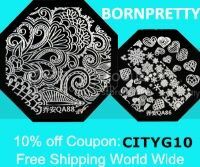 She is based in the US, but does ship internationally. Well, I hope you liked this design, and that you'll give it a try and spice up a plain French. Here's an idea--if you're already wearing a white tip, try adding a pop of colour over it like this when the tipwear starts to show. It adds some more interest and prolongs the life of your manicure!